As some of you may already know (and some of you may not! ), you can actually donate more than one type of blood product. When you think about blood donation, most people probably first think of whole blood (when a person gives one pint of their blood). But another equally important type of donation is platelet donation. Platelets are also called thrombocytes. Platelets are the smallest of the blood components and can only be seen under a microscope. Platelets have two states, active and non-active. Non-active platelets are shaped like small plates but when a blood vessel is damaged, the platelet receives a signal and rushes to the area to transform into its active state. In the active state, the platelet grows long spider-like tentacles that bind to the vessel, cause a clot, and stop the bleeding. Platelet donations at SBC are collected through a process called apheresis blood collection, or ABC. 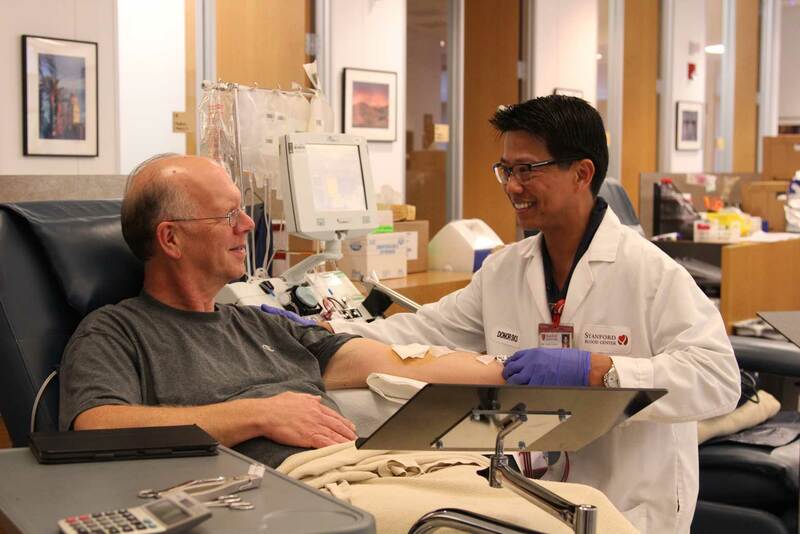 During ABC, instead of giving one pint of whole blood (as in a regular donation), an ABC donor gives only the components of blood needed for patients that day. ABC is made possible by an amazing machine that separates the components of your blood, retains certain components, and returns the rest to you. Are You Eligible to Donate Platelets? In addition to the same eligibility requirements necessary for whole blood donations, apheresis donors also need to have an adequate platelet count and total body volume (TBV). TBV is determined by the donor’s weight, height, hemoglobin, and gender. Furthermore, in order to minimize the risk of Transfusion Associated Acute Lung Injury (TRALI) and protect patients, female donors who have been previously pregnant are discouraged from donating platelets*. To find out if you are eligible for apheresis, come in for a whole blood donation and ask one of our historians about potentially donating platelets. Remember to increase your intake of fluids, calcium, and iron at least two days before your platelet donation appointment – this will help prevent negative donation reactions. You CANNOT take aspirin for 48 hours before you donate platelets, because aspirin reduces the potency and performance of your platelets. Platelet donation also takes a bit longer than whole blood…so be prepared to spend two hours for your donation (don’t worry, we provide you with a comfy blanket and entertainment options!). *To learn more about TRALI and why previously pregnant donors pose more of a TRALI risk, check out next week’s blog!